After a lot of discussions with local people, here we are with our newly launched limited edition kit with Organic Cold Pressed APRICOT KERNEL OIL AND MEAL (SCRUB) made by an NGO providing livelihood to women in Uttarakhand. Apricot farming in India is very limited. Apricot season in India is from April to September and the oil is only extracted during August to October. We wanted to get you the freshest, traditionally made and organic Apricot Kernel Oil which is why we launched this oil as a limited edition product. – Paula Begoun, the author of “The Complete Beauty Bible,” notes that apricot oil is one of the oils that has a lipid content similar to that of your skin. – Topical application of apricot oil helps soothe and heal rough, damaged skin. – The oil’s fine texture allows more rapid skin penetration, which promotes more prompt healing and nourishment of sore or chapped skin without residue. – Apricot oil helps prevent and minimize the appearance of wrinkles. – It is also beneficial in relieving the itch and irritation of the eczema-ridden skin. – Apricot Oil is rich in oleic, linoleic and linolenic acids which are friendly fats that fight off acne, inflammation, and dryness while locking in moisture. – Count on the oil’s linoleic acid to strengthen the skin’s barrier function. – Apricot kernel oil’s use in hair care formulations is similar to skin care. It acts as an emollient and is a light oil (easy to wash out and it doesn’t weigh down thin hair). Our Apricot Kernel Meal is finely ground from the kernels of the apricot fruit. This finely ground powder is perfect for gentle exfoliation without making your skin dry. It has a lovely aroma because of it's Apricot oil content. Just mix half tablespoon of our apricot kernel meal with rose water or milk for a mild exfoliator that won't make your skin dry. 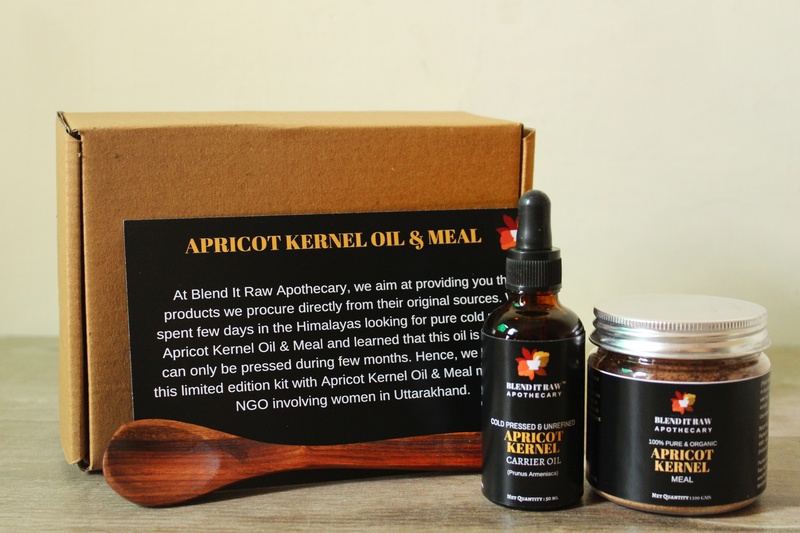 You can now get your hands on our limited edition kit with Organic Apricot Kernel Oil and Meal (scrub) made by a small NGO in Uttarakhand on our website. Link to shop in our bio. Our Apricot Kernel Meal is finely ground from the kernels of the apricot fruit. This finely ground powder is perfect for gentle exfoliation without making your skin dry. It has a lovely aroma because of it’s Apricot oil content. Just mix a half tablespoon of our apricot kernel meal with rose water or milk for a mild exfoliator that won’t make your skin dry. You can purchase this limited edition kit HERE.